After the day’s 5 hour hike, we were in dire need of a good cleaning once we arrived in Menji, the village where we’d be staying for two days. I’ll be honest, it felt rather convicting to feel as though I had somehow earned that luxury by merely hiking from one village to another, given that these people exert that much effort on a regular basis, and it’s nothing out of the ordinary for them. There are teachers that walk that far to work in the valley during the week. Some walk further. Church alone is nearly a two hour walk from Menji, a walk that many faithfully make every Sunday morning, as well as for additional church services. Regardless of the physical exertion we’d put out that day, cleanliness required water, and water was precious and scarce. Our best option was a local stream an easy 10 minute walk past Menji. Captain Ed offered to walk the women to the stream so he could show us where to bathe, and while we bathed, he would hike back to Menji and get the boys. The best place to bathe was just below a shallow waterfall that flowed under an old footbridge. The water was cool, clear, and refreshing to our tired, dirty and achy bodies. It felt so good to have an opportunity to wash up! I had brought goat milk soap, and used a bit to wash off what seemed to be an inch of caked dirt and sweat off of me. Once I washed up, I chose to sit down in an area of the river that enabled my body to be submerged up to my shoulders, that way I’d let most of my body soak, but not get my hair wet. It was so good for our limbs to float, gently supported by the water. Wendy sat nearby as well, each of us allowing our tired muscles to soak, relax, and cool down, while watching a gorgeous array of butterflies converged on the opposite shore. 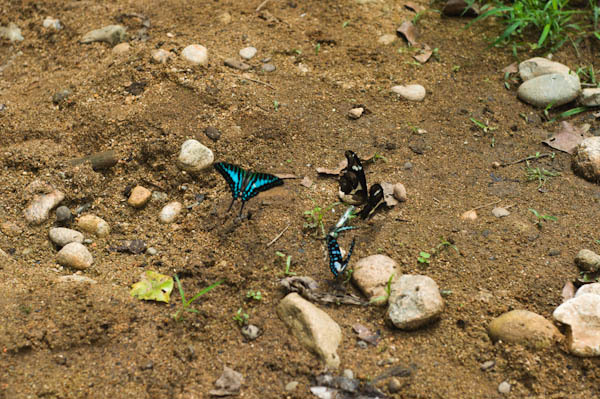 It was mesmerizing to see so many varieties of butterflies in one place, especially the ones with unusual color combinations that we would not have the opportunity to see back home, such as black and aqua. As my eyes adjusted to the colors in the stream and the flow of the water, I began to easily track the movement of fish swimming nearby. There were so many! As I kept watching them, I realized that their movement was unusual but familiar... It took me a moment to realize that these weren’t regular fish, but seemed more in line with a plecostamus or “algae eaters”. They would hover above all the rocks, moving slowly as they fed off the algae on the rocks, but would bolt as soon as they sensed nearby movement. Traditional plecostamus originate from South America, so these weren’t likely true plecostamus, I don’t know, but they were a very similar style of fish as far as swimming movement, behavior, and activity went. I’m surprised that with as many of these fish as there were, that they’d be any algae left anywhere in the stream! Back at our guest house in Menji, we ate supper and prepared our sleep area for the night by claiming a spot on the ground where we’d prefer to sleep, and getting our sleeping bags set up while we still had the advantage of daylight. As we were going about preparing our spots, someone noticed that we had unexpected company. Maybe to this enormous brown hairy spider, we were the unexpected company. Hairy Beast, as I’ve chosen to name him, was resting on a wooden beam above us, and didn’t seem to be in a hurry to get anywhere. I wasn’t alarmed, but I must admit I made a mental note to periodically check to ensure it was still there. It seemed preferable to me for it stay in that spot, rather than to find him wandering through our sleeping bags in order to find a dark and cozy corner in which to sleep... especially given that I had chosen the corner spot to rest my head that night... just sayin’! 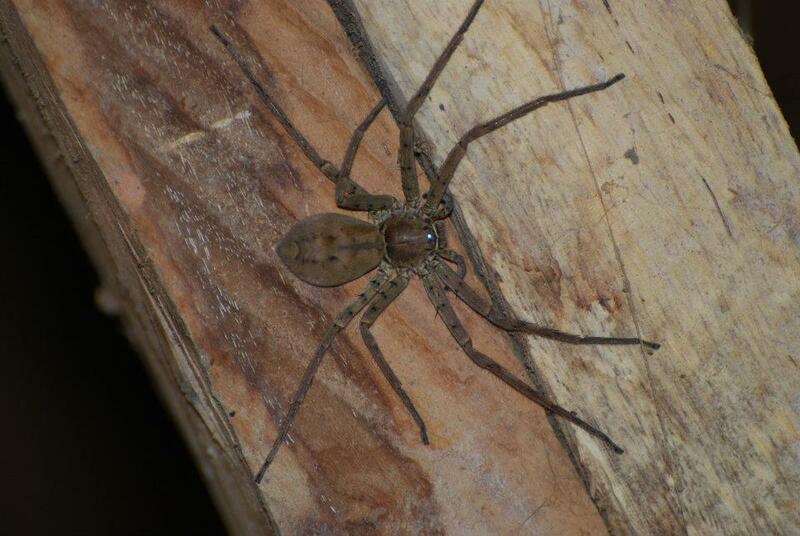 On a good note, no one had said that all spiders in Cameroon were venomous! Still, something about this one didn’t seem overly innocuous. Had any of us suffered from arachnophobia, he/she would have been able to add insomnia to their list of issues for the next lil’ while... at least until the sight of this spider the size a human hand faded from memory. The kids... oh my heart, the kids... 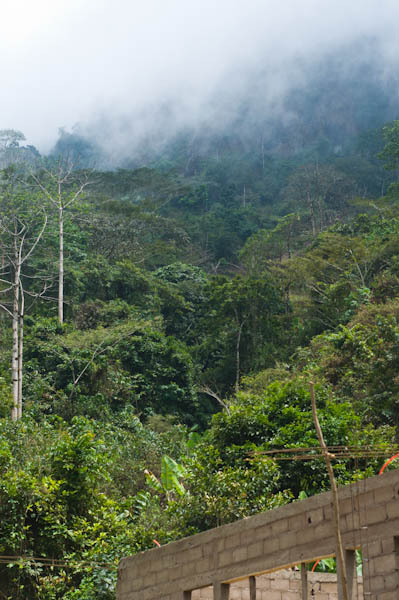 It was altogether different than what I had witnessed in Honduras and Ghana. 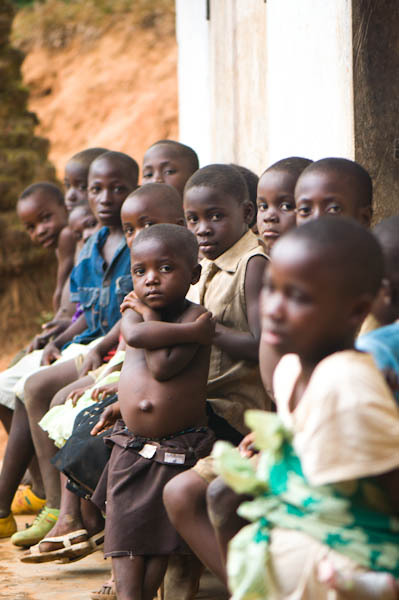 The kids here seemed subdued, reserved, and rarely approached us, choosing instead to observe us from a distance. Most of the time, when they approached, an adult would "shoo" them away from us. At one point, we were served fresh roasted peanuts, and one of the children who had lined up against the wall with a dozen other kids approached one of the adults that lived there to ask for some, and he was harshly reprimanded. Dejected, the young boy returned to sit by the wall. Time and time again, I had seen what I can only describe as adults treating children as though they are stray dogs. It’s a harsh description, but here, children come last, they are pushed away, and seem to be invisible. The more I watched, the more my heart broke. I got up, went to get a handful of peanuts from the tray, and went in search of the boy who had been pushed aside, his needs/wants dismissed. I called him to me, looked into his eyes and smiled as I opened his hand, and quietly gave him the nuts. I tenderly touched his face and communicated love to him without words. After all, are not a boy's heart and spirit worth so much more than a mere handful of peanuts? 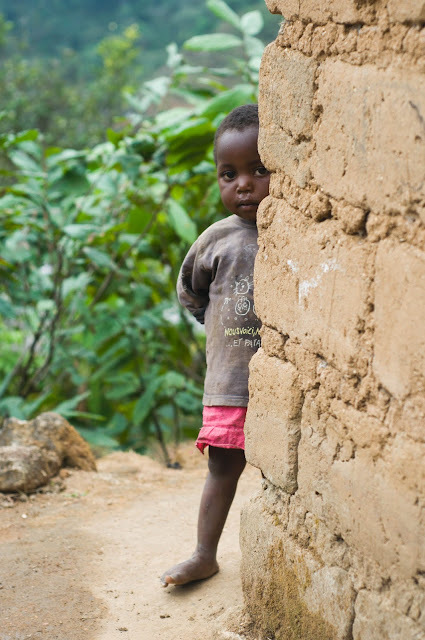 I was aware that doing so could cause trouble, as children learn quickly in this harsh environment that they can take advantage of our presence there and beg aggressively... and we'd had such issues already in Cameroon. Still... there are times when we are called to be love against the grain, and this was one of those times. 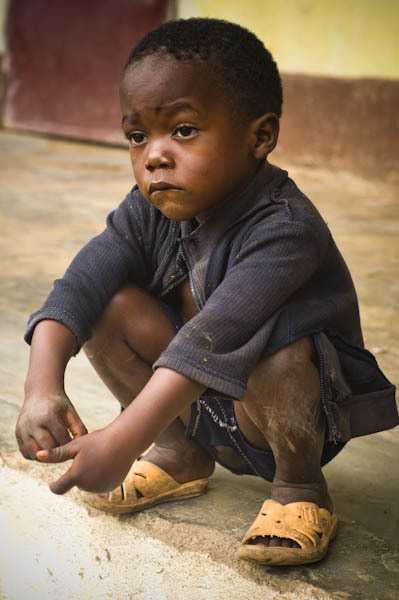 It had less to do with the food than it had to do with this boy’s crushed spirit. Children need to know they matter to someone, that someone notices them with love. Perhaps it hurt more to see that these children are not suffering from such things as much as they're suffering from the world's lack of compassion. I'm so thankful to the ones who do reach out to these children, to the broken, the hurt, the sick, the poor, the oppressed, the enslaved, the lost... may it lead to a viral outbreak of compassion that touches the lives of each and every one of those in need. I spent time with the kids who were on the outside, looking in. I took their photos, and made them laugh, paying attention to each and every one of them individually. 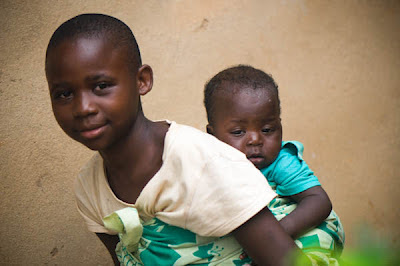 A young girl was carrying a precious baby on her back, and I asked her for permission to hold the baby. 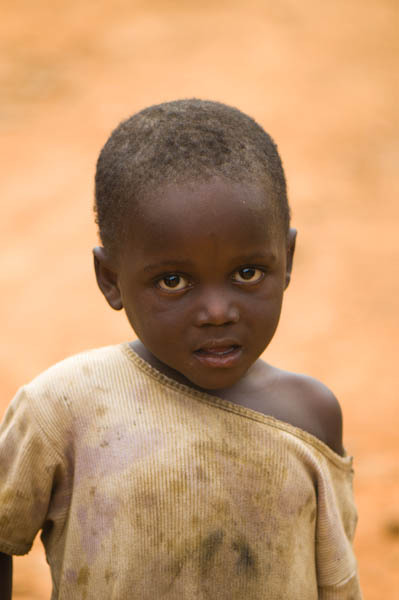 I wandered up and down the courtyard, completely lost in this beautiful little girl’s eyes that I held in my arms. The world could have stood still, and I’m not certain I would have noticed. I eventually had to give her back, much to my chagrin, and doing so made my arms ache from the emptiness, but there were so many more kids who were hungry for attention. The activities for the following day were optional, so I asked Dominica, the woman who had been hired to cook for us, if she attended church in the area on Sundays. She said that yes, she normally went to a Catholic church in the area. I asked her where it was, and if I could accompany her. She said that it was a little less than a 2 hour walk, but that since she was cooking for our team, she wouldn’t be able to attend church the following morning. It deepened my appreciation even more for the hospitality she extended to us. 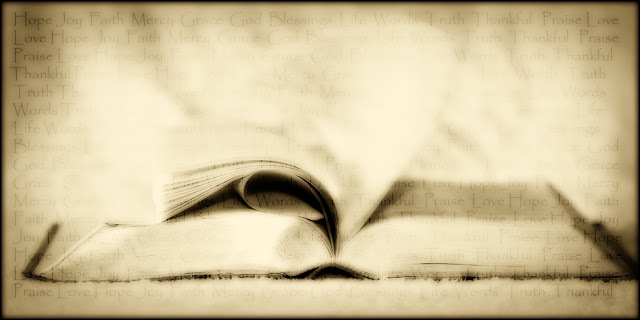 As I was sitting outside at the table that evening, journaling by flashlight while the team hung out and swapped stories, I began to think of Dominica not having a copy of the Bible, and how difficult it would be to get to know God intimately without His words, His love letter to us, His guidance in written texts. How rich are we, to have more than enough, when the opposite of extreme poverty is simply “enough”? Even as much as I give, I still have too much. I thought of the small sacrifice it would be to go without a Bible for the following 7 days, in order for someone seeking His word to have one for countless years... I could give her the Bible I had brought with me. Nothing less than that would ever make sense. I just wished I could do more while I was there, with her. 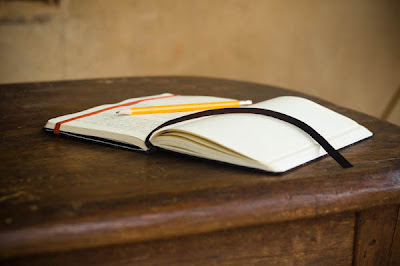 As I was journaling, some of my team mates asked about my journal, what kind of things I write, and whether I'd be willing to share. I said I'd be willing to read a few pages to them if they'd like, so they joked that we could have tomorrow night's round-of-beers non-campfire activity as "JD reading from her journal." Although in the end it didn't happen, they're welcomed to read bits and pieces of it on these blog pages. As for the paper version, the journal was quickly filling up. My Bestie had prepared this journal and sent it to me just for this trip, so that I could write during my down time. She had written a letter in the beginning pages, as well as tucked letters of encouragement in the back for me to open as I felt led to. In the journal's pages, she randomly wrote secret little notes and messages to make me smile. My favorite was "Still writing, eh?!" She knows me well. I still had so much to journal, but the light I had tucked into my bandana to light the pages was attracting an increasing number of bugs, which was in turn drawing the bats to me. They were swooping around my head in search of a late night snack. It was well past time to go to bed anyway, my mind was doing the craziest things the longer I stayed up – like considering going for a run the following morning... I had walked, hiked and climbed in Africa, but never run... Someday, I will – but not this Sunday. Unless I end up having to chase a snake, or outrun Hairy Beast’s 8 long hairy legs? Imagine yourself as having a finely tuned sense of direction, always knowing where you are geographically and being able to picture a location on a map very easily, kind of like the gift of an internal GPS. 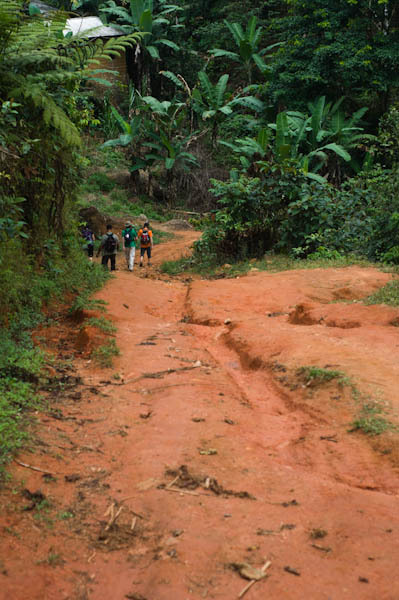 The area of Cameroon we were in was so isolated, so remote, so complex... the twists and turns of the trails so confusing and confounding that my internal GPS threw its hands in the air and completely cried uncle. ...Or what it would have really taken for me to cry uncle too. 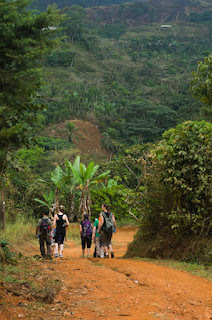 Feb 18, 2012 -- Hike from Njilap to Mengi, aka "This Is The Hike That Never Ends!!" As a photographer, I'm used to bringing my camera with me in spite of the added weight of the gear. It's a small inconvenience for the ability to capture moments and experiences in photos. Today, though, the decision wasn't a matter of inconvenience, it was a matter of being able to complete the hike. The ten pounds of camera gear would slow me down, and given the pace we usually kept, there'd be little opportunity to use it anyway. My priorities that day were the 2 bottles of water I'd have to carry, beef jerky, a sweat rag, and a strengthened spirit. Captain Smith advised us to wear long pants for the hike, as we'd be trekking through the jungle and the low-lying vegetation and thorns would likely cut and scrape our legs as we hiked. We did not need to offer an invitation for infection to set in. Long pants... I was dumbfounded. Long pants, in Cameroon? Yes, my prayers for rain had been answered once more, but the last thing I considered packing when preparing to travel to Africa was pants. I am Canadian. I can't imagine African weather being cold to me, in any season, under any condition. Nor can I imagine wearing pants on a hike. I'm known for jogging in capris in the dead of winter in Canada. So capris it was. It was the only option aside from sarongs, and the kind of hiking we were expecting today simply didn't call for a sarong, you know? It would be the third day I would wear my capris without washing them, but Joshua had gone through worse in Ghana and he turned out just fine (we took longer to recover!). There was probably no point to putting on clean clothes anyway. We'd had no running water in Njilap, and hadn't showered since leaving Lewoh. I had felt conflicted about adding the weight of my camera gear to my large hiking bag, since a porter would be responsible to carry that increased weight. Peace came from envisioning a strong, fit man easily carrying this bag, used to carrying heavy weights in this kind of environment and terrain. Walking outside to find a group of children awaiting to carry our large hiking bags made me stop dead in my tracks. This backpack was made for an adult to carry, both in size and in weight, and here these kids were, willing to help because they knew we were helping provide schools to their communities, and because they'd earn a dollar or two... for an hour or two of heavy duty hiking. As we all stood outside nearly speechless, one child took someone's hockey bag, plopped it on his head, and started up the hill seemingly effortlessly. Months of helping carry sand bags back and forth from the river to the school, perhaps? The child with my back pack was struggling to balance the weight of it on his body. I'm not sure he weighed more than the bag itself. The waist belt, even fully tightened, slipped past his hips and rested loosely on his thighs. The only saving grace was that the chest straps helped keep the shoulder straps in place. He never complained, and quickly joined the other children, but it still wasn't well with my spirit. The contrast between the hard work these children were willing to do, and the avoidance of hard work so many kids struggled with back home was tough to see. In ways, as hard as it was to see children laboring so hard for every aspect of their lives, I felt just as much heartbreak over what our own kids are missing due to their sheltered and slothful lifestyles. Our children all too often choose the path of least resistance. At what cost? Where is the balance in it all? The last thing to do before beginning the hike was to embark upon another "NCA" -- Nature Call Adventure. Joined by my trusty latrine partner in crime, Wendy, we set out to take care of business. 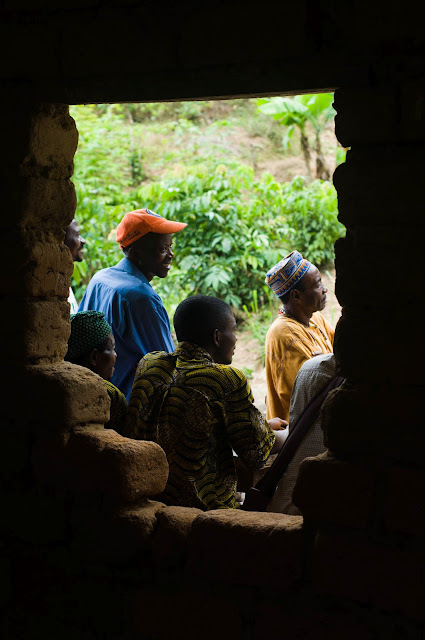 Before we had a chance to do that, however, we discovered, in graphic and gruesome fashion, that previous NCA participants had experienced some issues hitting their target in the sole latrine stall in the neighborhood. I was familiar with the "Cook This, Not That" Kitchen Survival Guide books on making better lifestyle choices, but before I had a chance to stop the trainwreck of thoughts (brainwreck? ), I began to wonder how well an "Aim Here, Not There" African Latrine Survival Guide would sell. You never know, there may be a niche for such a thing -- wait, there was! We could simply target the perfect candidate in our midst, for starters. Uhm, speaking of targets... I can only assume that this anonymous squatter knew to aim for the hole in the floor beneath him or her. How, then, does it end up at least a foot high up on the wall behind them? Does gravity do weird things in Cameroon, or...? When it became our turn, all we could think of was "don't back up.... don't back up... don't lose your balance... stay away from the wall..." Not the easiest feat while enclosed in a 3 foot by 3 foot space with your pants around your ankles. By this point, thankfully, we were well experienced and we succeeded without incident. 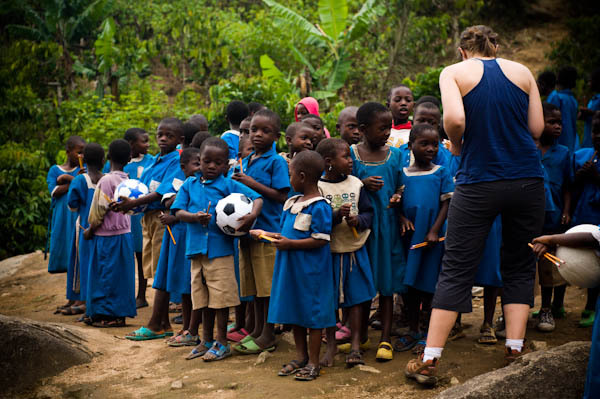 These are all the things no one warns you about when it comes to mission trips. Consider yourself warned. You're welcome. We started up the same trail we had hiked the day before. This time, we would hike past the school and continue much further until we reached Menji. To this day, I don't know how I ever got the impression that this hike would last roughly one and a half hours. I was convinced that we'd hike the 45 minute to the school, continue another 45 minutes or so, and soon reach Menji. I was mentally prepared for exactly that, even though really, each day, my mind was prepared for something incredibly intangible. There were always so many conflicting opinions and reports on how long each hike would take, that we all took them with a grain of salt, following only Captain Smith's lead, and packing the exact amount of water he told us to. I never truly had any idea what to expect in terms of challenge, hike, terrain, time, difficulty level, and my ability to push through the physical demands each day brought. This day would be no different. 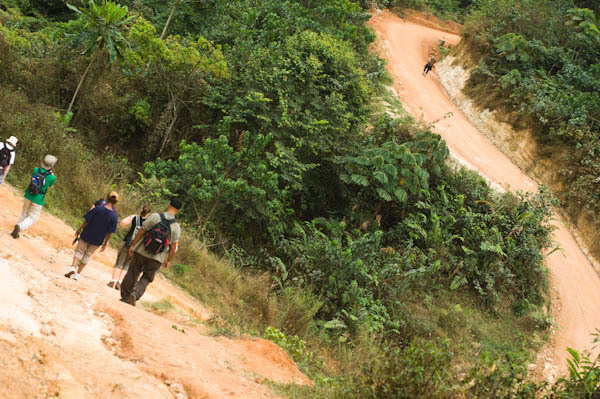 Once past the school, we kept hiking through the valley jungle, on well worn footpaths and tiny trails. The path was tricky and very uneven, at times less a path and more a pile of treacherous rocks, usually at a downhill incline. Some stretches of rock strewn paths were steep enough to warrant needing to brace ourselves with our hands as we squatted down to the next footing, and the next, and the next, being careful not to lose our footing on the slippery rocks, damp from the previous night's rain. 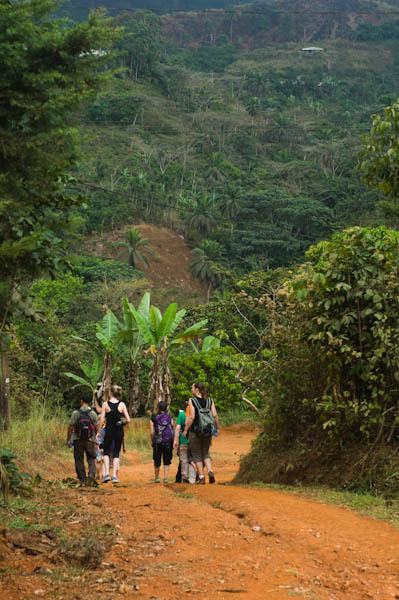 Through streams, heavy vegetation, steep descents and the humidity of the jungle, we hiked well past the school before stopping for bananas offered by a generous villager. As much as the reprieve from the hike was welcomed, I knew from the previous hikes that it would make starting again all the harder. There was little opportunity to stretch properly and really rest, but at the same time, it may have been easier for me to just keep hiking and keep up the momentum. The descent into the valley was probably beautiful, but I must admit that I did not see much of it. 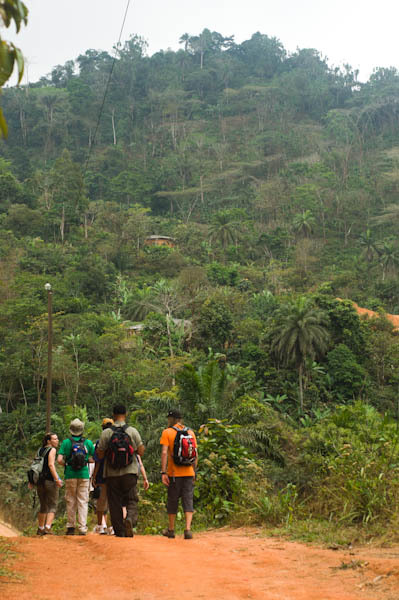 Since we were in a heavily forested area, we couldn't see very far ahead or enjoy a panoramic view of the valley from where we hiked, but even if that hadn't been an issue, our eyes would have still been glued to the ground ahead of each of our steps. One missed step, and our mission could have ended up being a medical rescue effort. 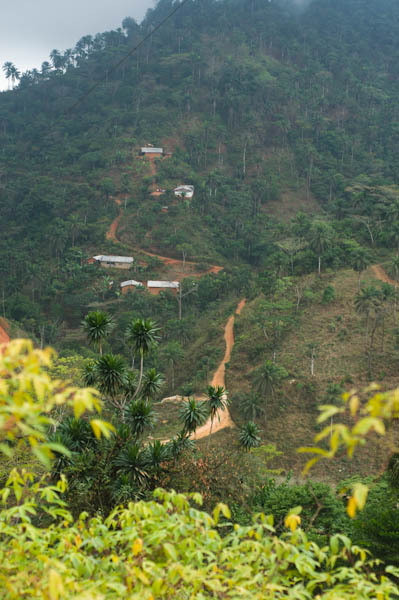 From time to time, we'd be blessed with brief flat trails winding through the jungle in a gentle descent; a sweet albeit short reprieve in between tougher stretches. There was something missing on this hike -- fear. I don't always notice its absence, since I simply know that I don't have fears. I would notice its presence more as it would be a shock to me. I think that had I been afraid to trek through the remote, wet jungles of Cameroon in difficult terrain, with bugs, and questionable plants and wildlife all around, including those infamous snakes, or simply harboring the fear of something "bad" happening, it would have caused constant hesitation and slowed me down considerably. Over and over again, I witnessed the gift of a strong mind, and how it could counteract a weaker body by strengthening it through self-control. I ended up with an extra portion of protein when I swallowed an unidentified flying insect. At least I hope it was an insect. Something about adding 6 legs sounds so much better than 8... for the record, it wasn't very palatable and burned the whole way down. Though I had managed to keep my balance the previous day on the muddy slopes leading into Njilap, I took my first real jungle tumble that morning when my foot slid on a wet rock and my knee ferociously kissed the ground without warning, sending me tumbling to the ground in the process. Since we were hiking in close proximity to one another and in single file, I stood up nearly as quickly as I had fallen, and without hesitation, kept on trekking. I quipped that provided I didn't hear a bone crack in two, I was good to go. About half an hour later, I noticed my knee stinging a bit, and saw that I had scraped it in that fall. The sweat on my skin stung as the saltiness irritated the wound. I poured a bit of my drinking water onto my knee to rinse off the sweat, and after a few minutes, couldn't feel the sting anymore. When a torny branch scraped up my leg as I passed by, I did the same, soaking my sock a bit in the process. Thankfully I had worn my running socks, which wicked away the moisture. My hands kept slipping from my walking stick from the humidity, so I decided to wrap my sweat rag around the top of the walking stick to create a hand grip. This was so much more comfortable, and probably spared me from getting a few blisters on my hands. Imagine my shock to discover that we had been hiking for nearly 3 hours. It was at this point that I realized that the "wakka wakka stroll" was really a "wakka wakka that never ends." Wakka wakka was the Cameroon Pidgin English word for walk/hike/trek, and it was used in many a dry humored remark about the physical demands of our hikes. Three hours... time in Africa is so nebulous, so hard to grasp firmly. I was amazed and baffled to learn that we hadn't reached Menji yet. Where exactly was this place? God provided another distraction in order to push through the exhaustion. I struck up a conversation with Kristen, who was hiking behind me at the time. I shared with her that as much as the mission and purpose of this trip for me was fully humanitarian in nature, it was also fully personal: a celebration of all the hard work that made it possible to take part in this, as well as the affirmation of how far I'd come. There'd be no finish line, no glamorous bling, no fanfare... just a profound sense of gratitude and victory. Last but not least, perhaps it was just what I needed to help me reach my next milestones on the road to health. We talked about my weight loss journey, the gym, the personal training and coaching Tia had provided, how I started running, etc. She's really into fitness, so it was fun to connect over common ground and point out which somewhat more obscure muscles were taking a beating in that hike. I shared how it felt to be the only overweight member of this team in the midst of this physically demanding environment, how I felt like a marathon runner showing up for a world class event in sweat pants and Sketchers, but that I didn't want to let that slow me down from what I was capable of. My body might be weak, but through God, my spirit knows no limit. The conversation with Kristen made a difference -- it not only helped distract me from the fatigue, but it also helped me refocus and remember how hard I had fought for this, and how determined I was to finish it well. I wasn't the only one getting tired. Even Michael, who I was convinced had Go Go Gadget Springs in his knees which made him bounce down the trail effortlessly, was easier to keep up with. We were beginning to move along in the same tired pace. Three hours and thirty minutes after leaving Njilap, Amanda asked how long before we stopped. We were probably all wondering the same thing, each of us getting an ever growing case of "Are We There Yet". The Cameroonian guide grimaced and said something like "wakka wakka an hour". Thinking he was serious, she nearly broke down. As he started to laugh, they rounded a corner only to have her discover that we had reached our first pit stop: Lekeng. He had known this stop was just up ahead. The kids who were carrying our packs were waiting for us in Lekeng. They claim they had been waiting for us in Lekeng for about two hours when we finally showed up, which meant that they had somehow managed to trek to Lekeng from Njilap in roughly an hour and a half. In flip flops or bare feet, no less, carrying loads half the size of shopping carts and weighing nearly the equivalent of their body weight! 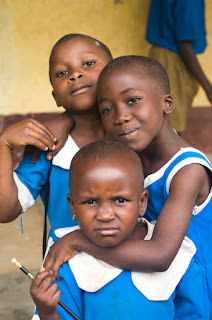 It brought forward memories of working with the child slaves in Ghana, but the only difference was that these children were free to do this if they chose, and they would be paid. 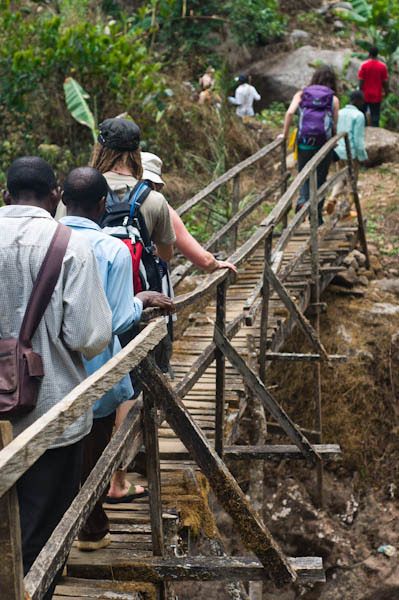 We walked over an incredible wooden bridge as we entered Lekeng. The boards were built seemingly haphazardly over a stream and rock crevace, creating a walkway perched on and around huge boulders. So beautiful, and so amazing to think the effort it took to bridge the gap between the jungle and this small village. There ain't no Home Depot in this town -- in fact, we only saw 2-3 people in the entire village, aside from our team. We rested at an empty local market for a bit before continuing. I stretched out for a few minutes on a bamboo pole table that would normally display local wares and harvests, but the only thing that would be on display today was a sweaty, dirty, stinky and well worn Canadian mamma, with not so much "wakka wakka" left in her. Wonder what price I would have fetched? I tried to stretch, and managed as much as possible, but I would have needed at least a good twenty minutes of stretching as well as some help. As much as I wasn't sure how much stamina I had left in me, I wanted to get going and finish this hike so that we could put it behind us. Within moments, we were moving again. Well, I was attempting to move, but my body had completely seized up -- this rusty nut just couldn't bolt anymore. I broke a walking stick at some point, and Darren or Michael helped me find another one. We checked on the progress of the school in Lekeng before turning on the trail that would lead us to Mengi. The trail was wider than the one we had trekked on to this point, it was more like a small road, which eventually turned into a typical Cameroonian dirt road. Most of the hike we had done to this point was downhill, but we were now paying for it. The rest of the way to Mengi was uphill, and the hills were brutal. At one point, I started looking around for hidden video cameras and film crews, convinced that we had somehow inadvertantly landed on the set of a new TV show pilot -- one where two shows battle it out for victory by pushing the contestants through a hybrid of Survivor Vs. Biggest Loser on speed -- I totally would not have been surprised to have seen Bob and Jillian jumping out of the jungle, screaming at us and chasing us to pick up the pace so we'd run up every vertical dirt surface in sight. Perhaps we could market such a show, along with the Aim Here, Not There book, and outfit an entire community in Cameroon with school supplies from the proceeds. Any takers? Clearly, my mind was going on overdrive, and I needed to shut out everything around me and simply focus on putting one foot in front of the other. By the time I reached Menji, it took a while to register that we had made it, and that this was the end of the hike. I looked down at my watch and stared for a few minutes, trying to comprehend how I had just managed to hike 4 hours and 45 minutes through the jungles of Cameroon. I didn't. Not through my own doing, at least. God had provided all that I needed. I showed her how to cut it, and explained that there was quite a bit of string in there for her to use. I wish I had captured the smile and delight in her eyes as we spoke, but the moment I lifted the camera, it was back to the business of seriousness! Feb 17, 2012: Into The Valley -- Destination, Njilap. Even though I had stayed up past midnight journaling, I slept well, even while Kristen and Wendy were packing up for the next day's hike. I had packed the night before, so I knew I could afford a little more rest. It would be yet another day of trekking, so the great sleep was appreciated. From this point on, we'd be in the valley, with no access to running water or any other luxuries. Yes, here, running water is a luxury. We'd also be sleeping on the ground. I was concerned that any night without proper rest would affect the following day's hike. We were told to pack whatever we would need for the next 5 days into our big hiking backpacks, and only pack 2 water bottles into our day pack for the day's hike. Two additional bottles would go into our big hiking bag, which a porter would be assigned to carry. I began to wonder if the amount of water we were told to bring was kind of like a difficulty rating for the day's hike. We would soon find out. I didn't leave much behind in Lewoh. My fleece hoodie, that was about it. I'd have no need for that here... although, much to my delight, God had answered my prayers lavishly once again. We had been told to expect unbearably hot and humid weather today, which would have made the physical challenge even harder. That's why I kept praying for rain on the eve of each hike. It had rained the night before, and His mercies were new this morning once again -- overcast skies, mild weather. YES!!! Everyone was baffled... except me. It was like a secret love letter from God, reminding me of His love. The plan for the day was to ride the Hilux [sounds like helix] as close as possible to the top crest of the valley, in the opposite direction of our previous hike to Efong. I think. Kind of. ...And making sure my mom didn't have use my freshly updated last will & testament. Just sayin'. Another truck would be hired to take our drinking water to the other end of the valley where we'd hike to a few days later. All we'd have on us is 36 hours' worth of water, which we'd be carefully rationing. The drive up the narrow mountain side roads winding along the edge of cliffs was wild enough in the cab. I can't quite imagine what it would have been like in the back of the Hilux, trying to stand while wobbling around, all while seeing the close calls an the death drops to our right! Even more fun when large trucks would come from the opposite direction, forcing us to delicately pass by on the narrow mountainside strips of dirt called roads. Kudos to the team members riding in the back -- their bruises may disappear over time, but the experience won't soon fade from memory! When we reached as far as the Hilux would go, we got out, unloaded all the hiking bags, and stopped for a quick rest at the local chief's house. 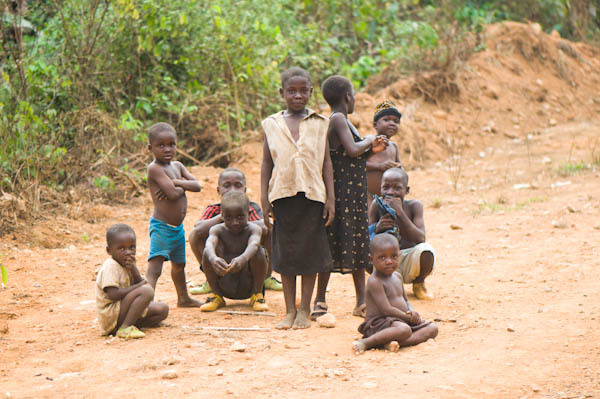 In this region of Cameroon, villages have chiefs. A chief is called a "Fon". He's kind of like a king of a kingdom, except he's a Fon of a Fondom. You can't make this stuff up. Seriously. In most places, I would imagine that guests of a king, a chief, of in this case, a Fon, would bring the royal leader a gift or an offering, and I would have thought most royal leaders wouldn't want the intrusion of a visit. Here, it was the complete opposite. It would have offended the Fon if we hadn't taken the time to stop by, and the Fon always insisted on giving us refreshments. We were served a soft drink the color of Cream Soda, except it tasted better. The only problem was that none of us were thirsty, since we had been riding in the truck, rather than hiking. The Fon prayed with us before we drank, and his prayer was beautiful and clearly Christian. I don't know much about him, but he seemed like a very wise and humble leader. The local headmaster of the school, upon hearing that we were passing through, left his classes in the care of someone else and quickly made his way down to the Fon's "palace" (read: rudimentary bungalow) to join us. He also prayed with us, and something about his prayer also made me feel very much at home -- perhaps it was that both he and the Fon spoke my language -- Christianese. It quenched my thirst more than the soft drink could ever have. From and through believers flows rivers of living water. We didn't stay long, we still had much hiking ahead of us before we reached the tiny village of Njilap (unsure of spelling). We started out on the top crest of the valley, and began walking along the paths beyond which only skilled mountain motorbikers could drive. I really don't know how they do that -- it was insanely (and endlessly) steep. It was yet another serious workout for the quads, knees and calves. I don't know who would have been more proud of me -- Brandon or Tia... or maybe even Jillian Michaels. One of the local guides had a walking stick that looked like a bamboo pole. As he walked ahead of me, I kept thinking that it looked as though his walking stick was getting shorter. It's crazy what these hikes will do to your mind. Or, is it? It seemed that I was not only seeing things, but I was hearing things too, like crunching that sounded like a cross between a horse munching on a giant celery stalk and the sound you hear in your head when you bite into a juicy apple. Man, I felt like I was really losing it. What exactly was in that Cream Soda? Well, ironically, the Cream Soda was made with sugar cane... so was the walking stick that the guide was feasting on. So, clearly, I wasn't losing my marbles. Yet. The stick was getting shorter, and I wasn't imagining the sounds! I don't remember much about the hike down, as my mind was elsewhere while my body simply focused on each step of the rough descent into the valley. The last half hour seemed a bit steeper, and a bit more tough. The entire hike was at a demanding downhill grade on rocks and slippery dirt that was damp from the rain the previous night. I slipped a few times but didn't fall. Some of these hills had such hairpin turns that it was hard to slow the pace down and change directions. Craziness. The view, once more, was breathtaking. The experience and the hike was wild, relentless, and awesome. I knew one thing for sure... a visit to the gym would never be the same after this trip. This was the real thing. It was hard to believe that I was here, in Cameroon, doing THIS. We reached the "chairman's house" where we would be staying that night. The chairman was the local resident in charge of the school construction project. We could see the school across the valley, and could even hear the sound of the kids singing. The school was a short 45 minute hike around the curve of the valley -- this meant that although the path would be treacherous compared to any of the previous hikes, there would be few hills. We rested for a few minutes and had lunch, then prepared to head to the school. The first few minutes of that hike nearly had me keeled over. My body, stiff and out of breath, revolted at the immediate climb we had to endure to get to the school path. Once we were on the path, after a good 5 minutes, my body adjusted and began to cooperate. It had little choice. I had heard the school kids practice their singing earlier, and it was drawing me to the school like an invisible magnet. 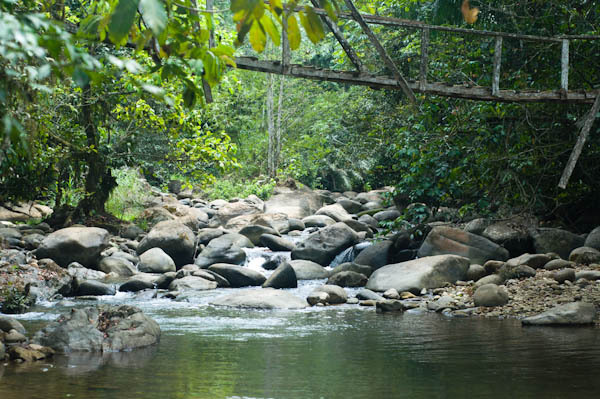 We saw beautiful streams and footbridges along the way. As precarious as some of them seemed, I didn't hesitate -- the more adventure, the merrier! The school was incredibly isolated. There were 67 students, all of whom were lined up in rows according to class (grades). There was not a single peep from the kids, their discipline even more impressive than what we had seen at Efong. Well, in hindsight, I don't know that "impressive" would have been the word... seeing the children like that left me feeling uneasy about how unnatural it seemed to have children so rigid and obedient. I didn't want to speculate on the methods they used to produce these results. 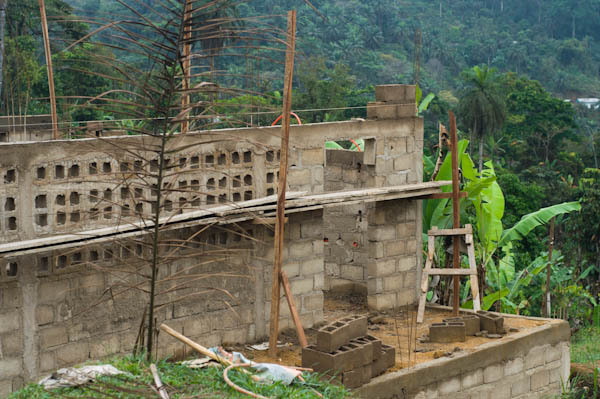 The existing school was made of mud bricks, and needless to say, mud brick buildings don't hold up well in the long rainy seasons. Especially in an area where it rains 6 months out of the year. The constant need for maintenance on mud brick buildings takes away energy and resources that could be better used elsewhere. These people worked hard enough as it was. 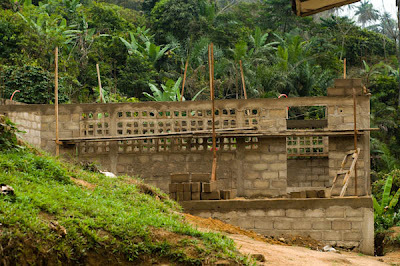 Just as we'd seen at the school in Efong, the new school construction here was well under way. 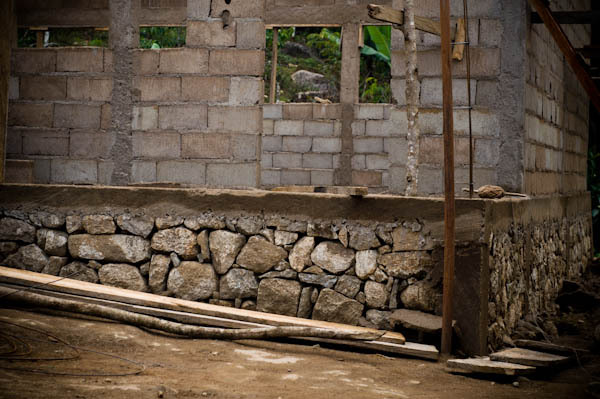 This would be the first structure to use cement in that community. The sand for the cement is brought in from small local streams. The villagers dredge it from the streams by hand and carry it (usually on their heads) in 30lb rice bags, up to the school. 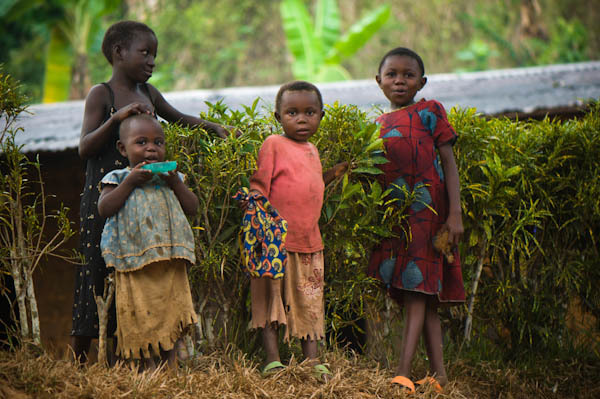 For these people, it's much more than hard work, it's the reality that this school will greatly improve the lives of their children and change the future of this community. 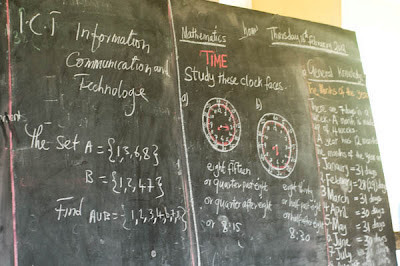 Only three teachers teach at the Njilap school. It's not hard to imagine why. 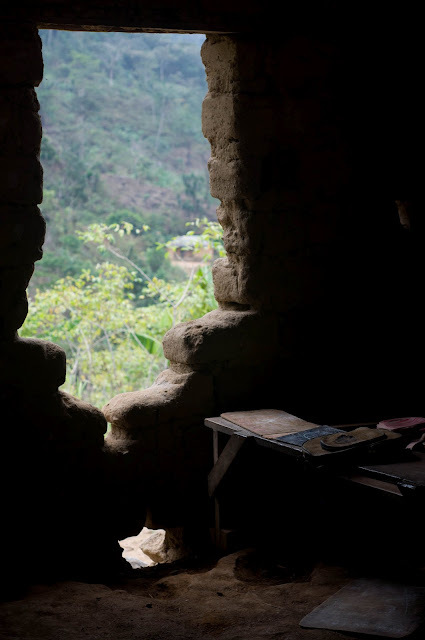 One of the teachers was posted here by the government, but her husband and 3 young children live in Dschang, a city quite far from the valley. 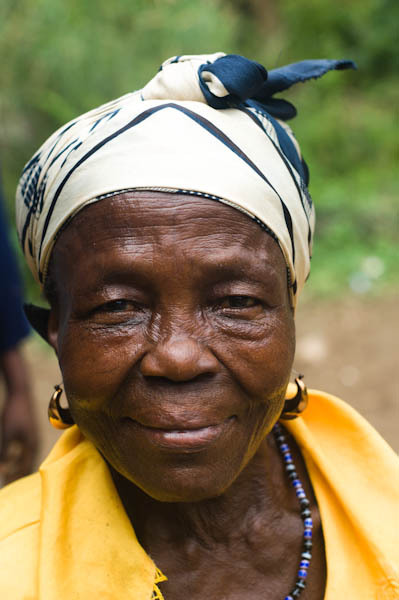 Each weekend, she treks back to Dschang to be with her family. Each week, she treks back to Njilap, where she spends her time being one of the most dynamic, driven and devoted teachers I've ever met. She wanted to be a lawyer, but had to drop out of University due to lack of financial resources to continue. 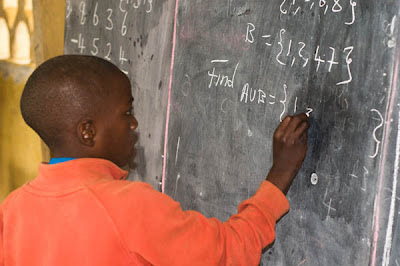 These teachers teach without resources that most of us, (teachers, parents, students), take for granted. There are no textbooks in Njilap. Paper, notebooks, pencils, pens, erasers... rare. Never mind the teaching aids, the storybooks, or anything else that would enrich the learning journey. 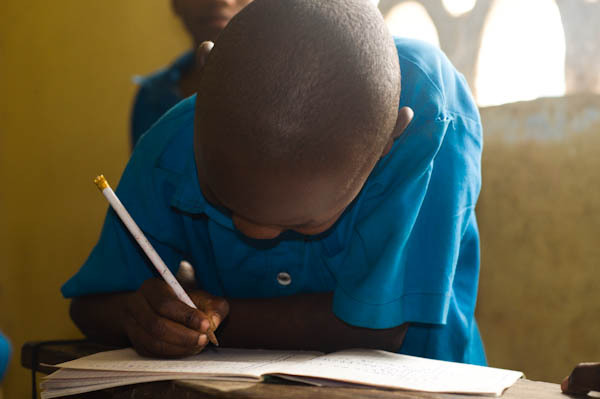 When the teacher tells a parent that their child needs a pencil, those needs often go unmet. 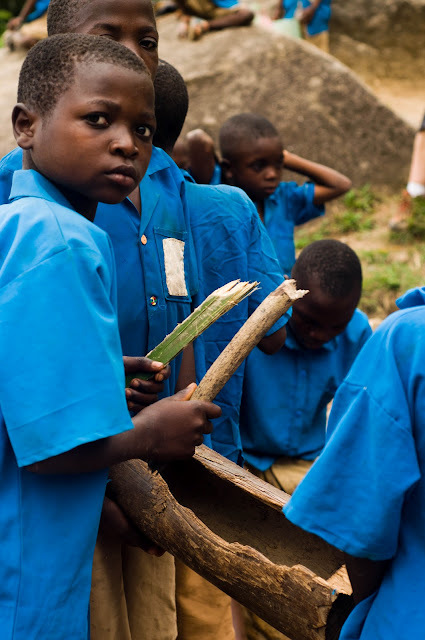 The villagers all live well below the poverty line, the mere 130 francs cost of an HB pencil is prohibitive. Most, if not all of these primary school students are the first generation of students in their family. This means that most parents not only can't afford to purchase uniforms or school supplies, they also can't assist with the complexity of the materials the kids are learning Having never gone to school, some parents don't yet see the importance... but many do, and those are the people investing sweat equity into the new school construction so that their kids will have the hope of a successful and bright future. 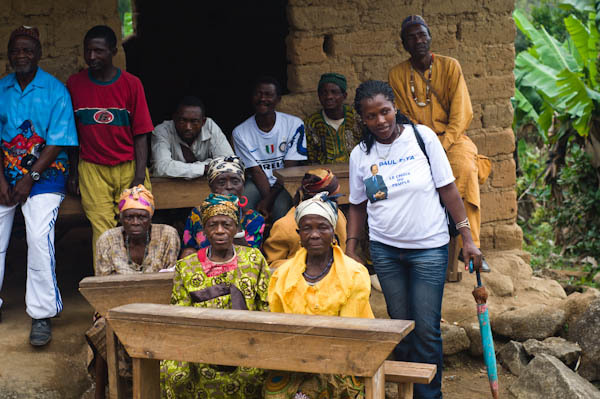 Over and over again, we heard how encouraged they were that we would take the time to help them achieve a brighter future for their communities, and how grateful they were for our assistance, even though they were the ones doing much of the work. Anna (above) and Elise (below), distributing donated school supplies. What a blessing of joy it was to distribute the school supplies we had brought to these kids. 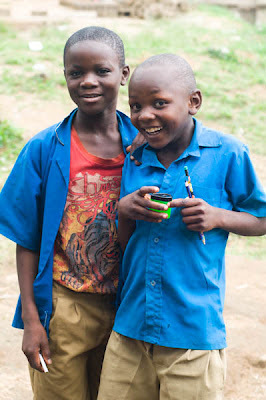 Pencils, erasers, sharpeners, even individual crayons, all brought such smiles to their precious faces. 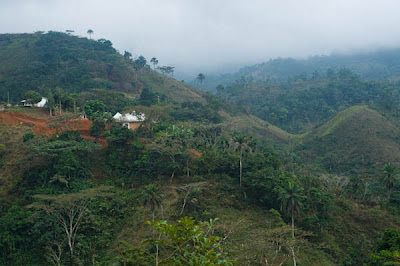 The tide of poverty is turning in Njilap, where hope rises thicker than the mist hanging above the jungle mountain tops. The kids brought out wooden instruments such as drums and hollow logs with sticks, and they put garments with attached hollowed nut/seeds onto their ankles and calves in preparation for their traditional dance. The music, the voices, so moving. 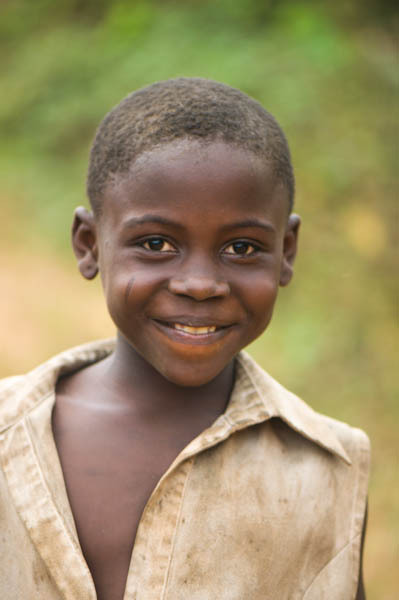 There is nothing in the world like the voices of African children, carrying a song to our hearts in unison. I was able to get some video, but I don't quite know how to load it onto this blog post. In the meantime, I'll see if I can upload one to Facebook. Wait... it might have worked. Miracles never cease when it comes to all things Africa related, eh? The school construction was the most advanced we'd seen so far. By the time ICA returned, it would be completed. The community was quite proud of their accomplishments, and they had every right to be. The work was well done, and they weren't finished yet. A latrine was also being built behind the current school. 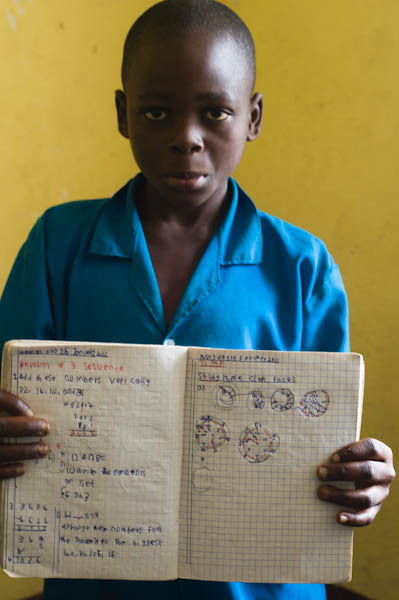 It's hard to imagine a school in Canada without toilets, running water or other basics. I loved seeing the elderly women from the community gather on benches in the shade of the school to watch the festivities. I wish I could have spoken their language -- I'm thinking they had some great stories to tell. Some of them seemed like such lil' firecrackers! A few of them were holding sweet, precious babies... ahhhhh! Although I had tried to keep stretching my legs and stay hydrated while at the school, when it was time to leave, my body revolted once again. Darren, one of the guys from our team, had a handful of small nuts or seeds that the school kids had given him. You're supposed to chew them with your molars until the flavor is gone, and then spit them out. He gave me one to try... it was awesome -- tasted like creamy coconut, and surprisingly, it gave me a bit of a boost. I hoped to find more of those.... perhaps enough to fill my empty checked in luggage on the way home? It's hard to look for something that you can't point out in a grocery store and that could grow on a bush, a tree, or who knows what else. It doesn't help that the description makes it sound like anything ranging from goat poop to coconut flavored hazelnuts. I wished Tia would have been there to try one, but more importantly, share in the experiences of Cameroon with me. Traveling to Ghana and experiencing Africa with her had been such a great experience, it seemed strange not to have her by my side in Cameroon. I was hit with a wave of homesickness right then, one that caught me off guard. I had never been homesick on a mission trip before, not ever, not even by the end of our time in Honduras or Ghana. Why here, why now? I tried to focus on the butterflies dancing ahead of me along the path, even though I couldn't help but think of how much Jillian and Tia would have loved seeing them. 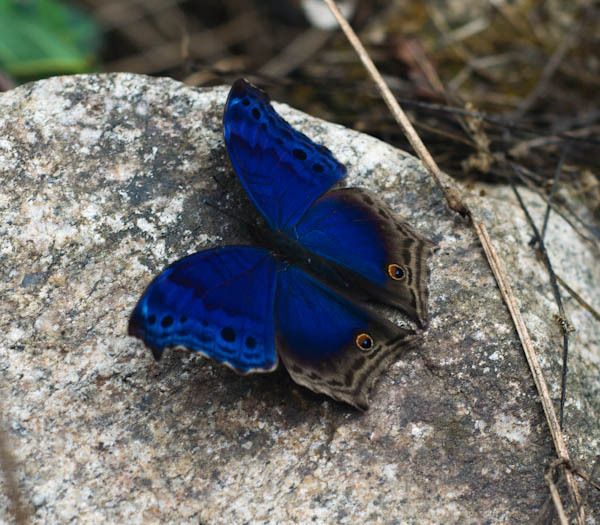 I was able to take a few photos of it before it took flight again, its blue wings a dazzling dance against the greens of the jungle and the rust red African soil. Back at the chairman's house, we ha supper and watched as locals gathered around to hang out with us. We were all quite tired, but they seemed to be in a mood to party. 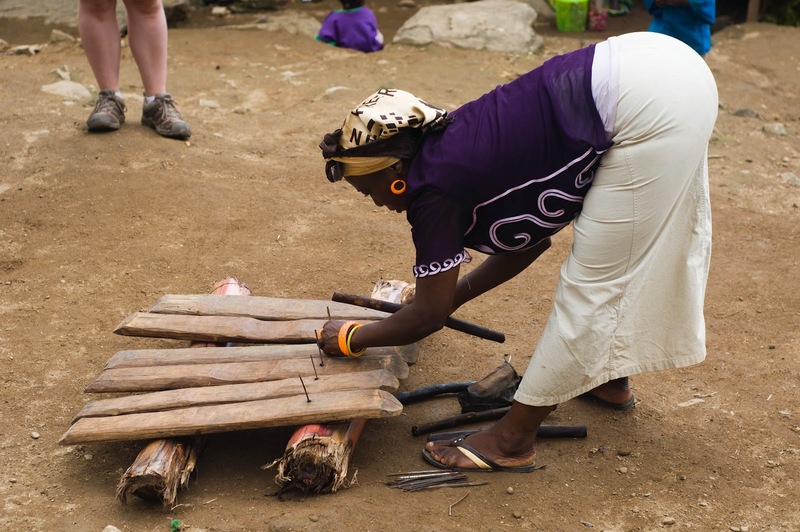 The women from the community brought out their bush nut dance-wear and brought out wood to make a xylophone like they had made at the school ceremony earlier in the day. Their dances were great to watch, but I did not join. I had a toddler in my lap, and I was quite content to stay planted in place, lest I fall flat on my face from exhaustion and give the locals an extra dose of entertainment. All I wanted was to spend some time with the kids... and there was plenty of opportunity! There were kids everywhere, all delighted in receiving a healthy dose of welcomed attention! Our team wanted to present a song to them, so Michael, our Newfoundland musician, stood up on a chair and sang an Irish jig while the rest of the team danced something akin to a square dance... or something. It was great, and the puzzled look on the locals' faces was well worth the effort. Priceless. By about 6pm, I was ready for bed. Someone had brought in a generator and was pumping the music quite loudly for all to hear. There was nowhere comfortable to sit and journal a while. Wendy was also tired. She and I waited another hour or so, then proceeded to start getting ready for bed. No small feat in the African wild! Brushing teeth, going to the bathroom, cleaning up and preparing the bed... it's all an artform of sorts, one made better by having Wendy as a sidekick. Knowing that the hike from Njilap to Menji-Fonjumetaw would be very demanding, we wanted a jump start on our rest. We assumed, from what we'd been told, that the hike would take roughly an hour and a half through the jungle trails -- our third hiking day in a row. Jillian Michaels would be proud. As we were preparing for bed, the chairman of the house approached Wendy and offered his guest room to Wendy and I for the night. This not only meant that we could avoid the party and get to bed earlier, but that we wouldn't have to sleep on the floor. What a God-send to receive this gift on what would turned out to be the eve of the hardest hike so far. Wendy and I laid down, grateful, and talked until about 9pm. By 9:10pm, Wendy was fast asleep. I followed shortly. 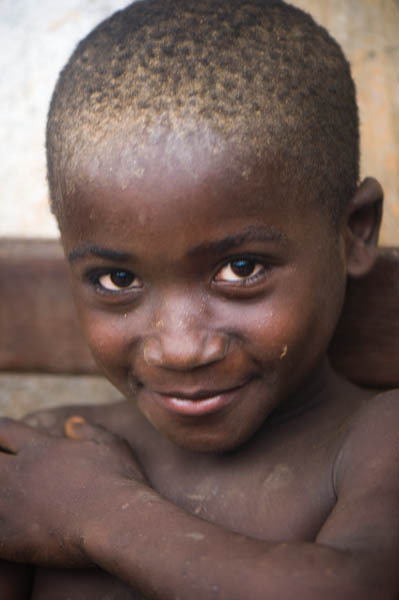 Out of all the villages and places we'd been to in Cameroon so far, Njilap made an indelible impression on my heart. Perhaps I will share more about this as I process the trip through journaling. Pray for the needs of this community... My heart feels compelled to launch a fundraising initiative to get some crucial basics such as textbooks supplied to the Injilap school. Not only would it encourage the students, but it would encourage the teachers as well. 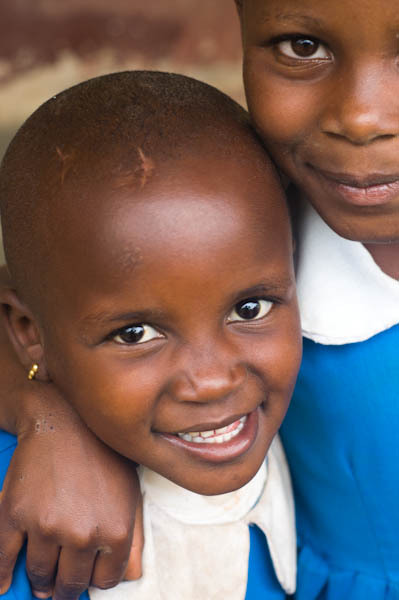 Through ICA, all funds would go directly to whatever they are earmarked for. I know that any donation would have a significant impact that would be carried through generations to come. Please pray for this school, for these families, children and teachers... and stay tuned for ways to help with the school supplies and more. P.S. -- Lucky for you, I am about as tired now as I was at the end of that day, so I saved myself some time and spared you from the sharing of the latrine photos and stories from the two adventures we experienced that day. You're welcome! I haven’t often prayed for rain. 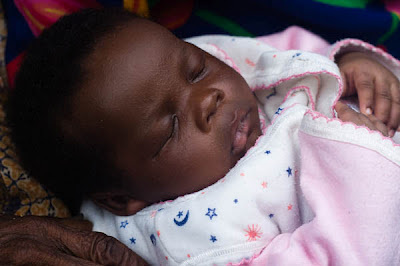 Oh, I’ve prayed for rain to fall upon distant lands – Kenya, where our Compassion son Noah lives, and the surrounding areas on the northeastern horn of Africa where droughts led to one of the worst famines in recent and not so recent) history. Back home, however, I pray for sun, warmth, and blue skies to replace the fog, rain, and the glum gray enshrouding our city with cool temps. This makes God giggle, apparently. I hoped He would humor me in Africa. 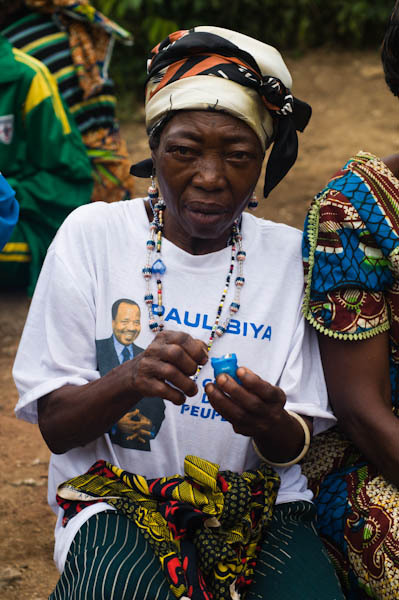 Our travels had led us to Lewoh, Cameroon, in the middle of February to follow up on some humanitarian projects under way in “The Valley”. The organization we were traveling with, International Children’s Awareness (ICA) had several school constructions taking place, as well as several water projects. Lewoh is remote in and of itself, but not as remote as the valley, where we’d be headed the following day. When an African tells you the weather is too hot, any foreigner of sound mind and body would normally turn around and run in the opposite direction. Instead, we would hike into the hot zone itself... first downhill into the valley to reach the school area, then, back uphill to Lewoh. That was just on the first day. Welcome to Cameroon, enjoy your initiation. As I laid down and waited for sleep to find me, I prayed for our hike the following day. I prayed for my body to be up for the challenge, for my mind to be stronger than my body, for mercy, and for rain... rain would lower the temperatures and bring relief from the heat for our hikes. Since I sleep very soundly, I wouldn't hear the rain or know until morning if God answered my prayers, but He had, and then some. When I walked into the living area the following morning for our 8am breakfast call, I saw that it was overcast, and the air felt cool. YES! 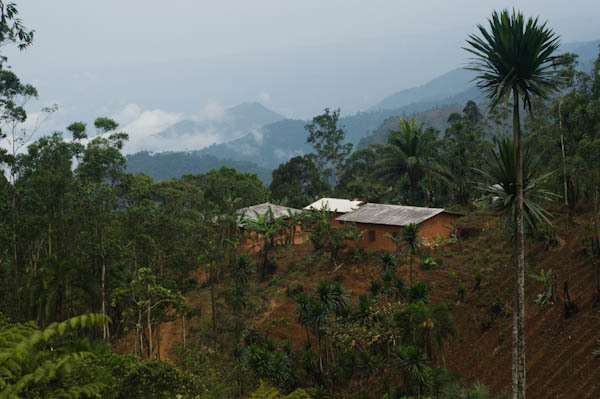 It had been milder than usual during all our time in Cameroon leading to this point, but it needed to continue. And so far, it looked as though it would at least for today. We were told to pack 3 large water bottles for today’s hike. Water is crucial when hiking in the heat, even on a milder day. Water also adds weight to our load, a disadvantage that could be very costly. One also has to seriously consider whether or not to also lug a DSLR and some heavy lenses. Last night, one of the local guides I had spoken to sized me up (probably wondering what in the world I was doing there with this group of young, fit and experienced people) and told me that “for a Canadian like me”, he estimated it would take twice the time as the more experienced crew, and much, much more time than a local. In other words, expect a brutal fitness challenge. It wasn’t just the heat, it was the terrain. No matter where we were going, it was either all uphill or downhill. No relief. I don't know what struck me the most -- the fact that every snake in Cameroon is poisonous, or that someone would think we'd have energy left to outrun one. As I’m eating breakfast, I’m debating whether or not to use the small but compact backpack (school bag) that would have been much less comfortable on my shoulders/back, or the large Columbia hiking backpack with a waist belt, chest straps, and all the support possible to distribute the weight well. I wisely chose the hiking backpack, and stuffed some homemade beef jerky in one of the pockets. The salt and protein would likely come in handy at some point. 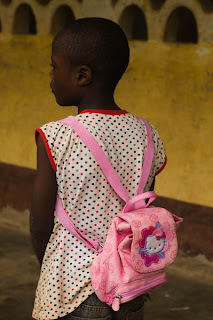 I also included a small child’s pink Hello Kitty backpack/purse that my daughter had given me before I left for Cameroon. It was a backpack she once used to put all her “hair pretties” in to take to ballet classes when she was little. She wanted me to find a very special girl in Africa to give this to. She said it brought back great memories for her, and that she hoped that it would create great memories for the little girl who would own it next. As we gathered outside with our backpacks on the front steps of our base camp, I was prepared to do or die – I was going to give it my everything and do this myself and for God. There would be no fancy *bling* medal, just an invisible badge of honor. More importantly, there was also the importance of being able to complete the hike on the simple basis that there was no choice – there would be no transportation available to bail anyone. Furthermore, I did not want to disappoint or concern the team as we began our work in the valley. As we set our backpacks on the ground outside, one of the local guides grabbed my oldest son Brandon’s army gear hiking bag that was full of school supplies and donations for the school we were visiting. It made me wish Brandon was here too. David, one of the other local guides, walked over to my big backpack that held my water, and hoisted it effortlessly onto his back. Surprised, I tried to stop him, telling him that this was not one of the supply bags for the porters, but he had no intentions of listening to me. Part of me wondered if he was concerned and very protective of me, or if the leaders had previously discussed this and planned it. Either way, I saw this as the unexpected blessing and answer to prayer that it was, and I was humbled. I hoped that the rest of the team would not see this as an unfair advantage, but instead as an extra measure to ensure that I wouldn’t hold the team back. 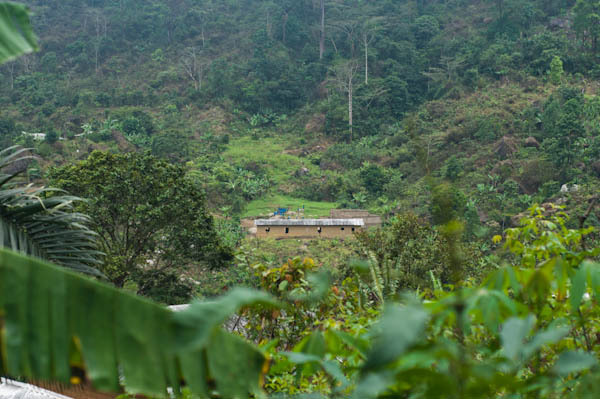 It was estimated that we’d be hiking downhill for roughly two hours into the valley toward Efong, where the school construction project was underway. We’d stay in Efong at the school for two hours to assess the development, distribute supplies and spend time with the kids and teachers. 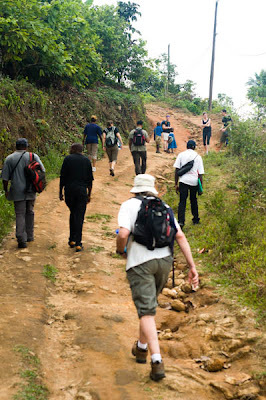 Once we left Efong, we’d be facing the gruelling 2 hour hike back up the steep mountainside to get back to Lewoh. They weren’t kidding about the massive hills. Jokes of our parents walking uphill both ways in the snow up to their waists to get to school each day ran rampant. We started going uphill to the crest of the valley, and then started a deep descent. I don’t think any treadmill I’ve ever been on had an incline quite this insane. If I ever thought going downhill would somehow be easier, gravity and all helping us – my quads quickly reminded me otherwise. What surprised me was my mental strength and stamina. As hard as it was (and it was! ), going all uphill to the crest of the mountain top, and then steeply down into the valley, I never felt discouraged, overwhelmed or remotely close to giving up. I felt confident and although I was at the back of the pack for most of it, it never felt as though I was unreasonably holding the team back. Whether this was because our team’s pace averaged out well or they gave grace to those who took a less demanding pace, it’s hard to say, but I think the fact that we arrived in Efong within the estimated time counted for much. Maybe I had simply improved. 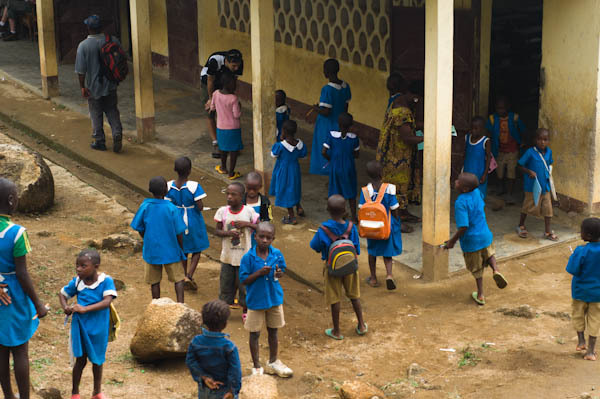 As we reached the school, we saw all the children wearing blue uniforms except a very few toddlers who were hanging around, possibly the teachers’ kids. Every day in Africa is “bring your kids to work day”! I looked up the hill at some point and saw a girl, maybe 8 years old, sitting by herself up on the hill above the school, away from all the children. She seemed to be the definition of the child “on the outside looking in”. She was not wearing a uniform, and wasn’t taking part in the kids’ games outside the school. My heart went out to her. In ways, she reminded me of Jillian when she was younger -- in her own little world, perched on the outside looking in. Such is life all too often on the autism spectrum. As I approached, I pointed her out to Kristen, one of our experienced team members who specializes in education. Kristen had seen her, and thought it was possible that she wasn’t a part of the school program because of some disabilities or challenges. The girl had not let Kristen come close. I kept my eye on her as I started climbing up the hill where she was sitting and noticed her shirt just as she stood up and bolted from me. Her shirt? Hello Kitty. I.kid.you.not. I sat down on the rock where she had been sitting moments before, and turned back to smile at her but couldn’t see her from my vantage point on the hill. She was higher up, beyond the little ridge behind me. I felt the Holy Spirit nudge me to extend my arm out toward the tree to my left. I kept smiling, at no one in particular, until she appeared. I didn’t move my arm, keeping it still and extended, waiting for her to come to me, certain that had anyone been watching, I would have looked pretty much ridiculous... It was like trying to catch a rare butterfly by standing on your head and reciting the alphabet backwards... but patience would be rewarded. She quietly came to the rock where I sat, and stood beside me. I could hardly believe it. And that she was this little girl. I tenderly put it on her back, helping her put her thin arms through the straps. She smiled as she tried to look backward at her back to see her new prized possession. I knew Jillian would be pleased. A beautiful transformation took place. 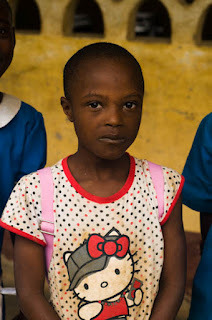 This timid, quiet little girl then walked with me down the hill to the school where all the students crowded around her to admire her new backpack. From the look of confidence on her face, I’d say this was a pretty special occasion for this precious girl. Her smile was priceless. She spent the rest of our time there mingling with the other children. Our team was split up so that there were 1 or two of us in each classroom at the primary school, to accompany the teachers in giving out the school supply donations. We had pencils for each child, a prized item in this remote area where pencils and notebooks are rare luxuries, as well as extras to hand out as treats: pencil sharpeners, erasers, notebooks, crayons. The children had to answer questions in order to earn an extra item. The kids were extremely well behaved. Discipline in these schools is much different than it is back home in North America. Corporal punishment is used – fear and respect go hand in hand here in Cameroon. I was assigned to the grade 3 class, who proceeded to outsmart me in math. *sigh* It doesn’t take much. The kids got a kick out of the fact that I didn’t know the answer. So would my kids! What I didn't know what that the "U" in the equation stands for "union" and you have to merge both sets and list the numbers from each set in order, only listing each digit once. Well, then! I didn't mind the kids poking fun at me -- God knows my weaknesses and uses my strengths! With my hearing issues, it was SO hard to hear the children's timid voices in the loud classroom, I had to really depend on the teacher to know whether or not their answers were correct. 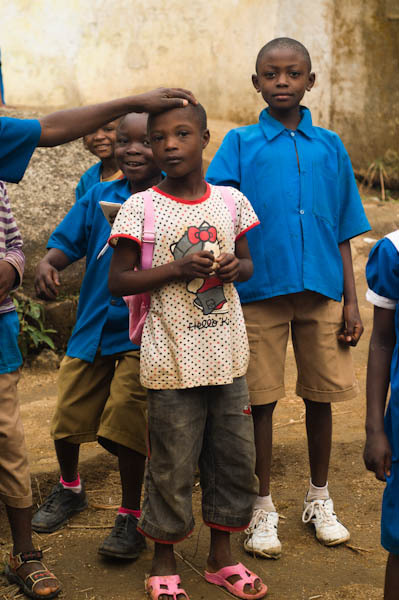 I'm so glad we worked hard to collect school supplies for these kids back home before we came to Cameroon. I knew they would be appreciated, as I had similar experiences in Honduras and Ghana, but this went beyond what we experienced there. These children were not part of a Compassion program, nor did they live in a Compassion assisted area. There is no Compassion program in Cameroon. 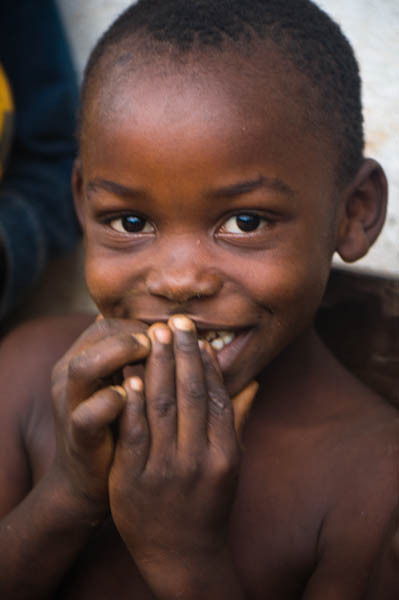 I'm so thankful that ICA has reached into this area and helped these beautiful children and their families to lift themselves out of poverty. I don't have the words to do justice to the impact that is being made in the valley. I think the light in her eyes and the smile on her beautiful face tells the story better than I could! 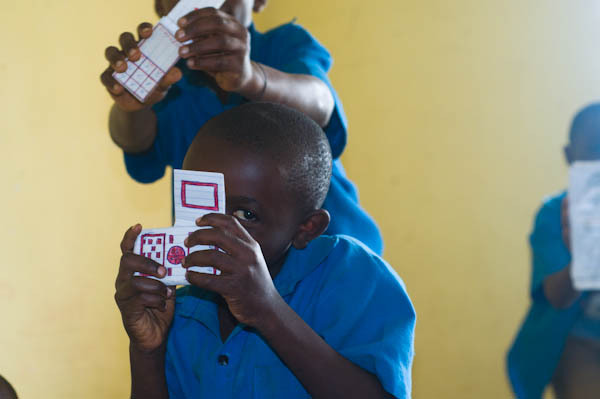 Some of the kids had made paper cell phones and cameras, and were delighted in showing them to me. I loved looking at their workbooks, and seeing their painstaking efforts poured onto paper. Afterward, the kids being too distracted by us “white folks” to keep their focus on their studies, they were let out for the day, and our team sat in the shade with the school officials while the kids played all around us. It was so much fun watching the children and interacting with them. Beer was served... along with soft drinks. It was a little surreal to drink beer at a primary school mid-day (or at any time, I suppose! ), but since I don’t drink alcohol, I passed on the beer. The soft drinks were tasty. Unfortunately, all the water we were drinking, and the drinks served, meant that a "nature call" was inevitable. Waiting until we were back in Lewoh in semi-civilization was not an option. Wendy and I, being the oldest two women on the team (and the only ones other than Captain Smith over the age of 35), typically paired up together for all extra-curricular adventures, such as trips to the latrines or, uh, elsewhere. We'd watch each other's backs and brave the wild together. As we hiked up the hill past the school, we were thankful this school had a latrine. Not all schools did. 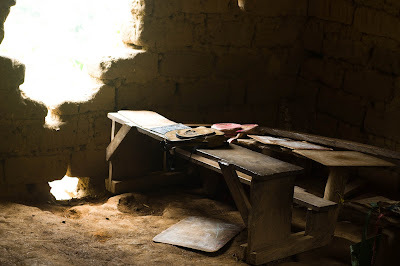 As we opened the door to the latrine and looked around, suddenly, having our nature call out in nature looked a whole lot more inviting... there are few words that can accurately describe the conditions (without losing all my readers in the process). Thankfully, I have no fears, so spiders, creepy crawlies, and unmentionable other issues weren't going to deter me from this experience. All the more to share with the kids later, right? I am pretty sure Wendy took a photo of this latrine. We took turns documenting them along the way. I'll spare you (this time) since Wendy has the photo. In the future, though, if I took a photo of it, you'll see it. Be forewarned! The school construction was progressing well and looks as though it will add 2 large classrooms to the school. Some of the current classrooms are used for more than one grade, so the new structure will bring relief to the teachers and the students. I don’t know how the teachers manage... they certainly don’t do it for the money. They all seem to have a tremendous passion for children and education. All too soon, it was time to start our journey out of the valley. The hike back was much tougher than the hike to Efong, as much of it was at a steep incline, we were already tired, and it was a bit hotter in the afternoon sun even though it was still somewhat overcast. It would have been SO much hotter if it hadn’t rained overnight. I was grateful. I started off well, but halfway up the mountain climb, I started losing steam and speed. I’d stop for water and rest until my heart rate would stop raging, perhaps no more than a minute to a minute and a half in order not to lose momentum, and then I kept marching on. At the top of the second to the last hill before the crest of the valley, I started feeling at the end of my strength. I came alongside Wendy and asked how she was doing. She was slowing down some too, so we started walking together, slowly making our way up the hill as our conversation distracted us from the exhaustion. I felt good again once we reached the top, and the rest of the hike back to Lewoh was a breeze. Our total hike there took about two hours there, and about two and a half hours back. The view on the way back was breathtaking – maybe it was part gorgeous scenery and part uphill climb that took our breath away!! What a feeling it was to look back down the valley and see how far we had actually hiked, even if we couldn't see much of it in one single view. That was when I saw the strength God had given me... I had beat some serious odds with God’s strength through me. Martin, one of our local guides, noticed what God had done as well. As we approached the base camp in Lewoh, he came up alongside of me and asked how I was feeling, and how my day was. I told him I was feeling good and was pleased with how our day went. He put him hand on my arm and looking at me straight in the eyes, he told me that he had been concerned about me that morning, but had been surprised by how strong I had been and how well I had exceeded his expectations. He said he didn’t think I would have been able to endure the hike or keep up with the team, but that he was so proud of me... that we had all finished within the anticipated time. That conversation would carry me through the next week of hikes. That little hike to Efong was nothing compared to what was in store for us in the following days.